What is a Set-In Sleeve? A raglan sleeve has a seam that moves from the underarm to the neckline. A set-in sleeve is “set in” the armhole of a garment at or near the natural edge of the shoulder. The set-in sleeve is the sleeve that is most often used in suits, coats and shirts because of its professional, natural look. The set-in sleeve can either lie flat, as it does in a man’s suit and dress shirt, or be gathered to pucker and rise above the garment at the shoulder, as it might in a little girl’s dress. Whether the finished set-in sleeve seam lies flat or is extensively gathered for a puffy look, the top of the sleeve is actually larger than the armhole opening. This makes it easier to fit the garment over the arm, and facilitates movement at the shoulder. The extent to which the top of the sleeve is larger than the armhole determines how high the sleeve rises above the garment, if at all. In any case, the top of the sleeve is gathered with stitches that are used to pull the fabric into small, evenly distributed puckers which allow the top of the sleeve to fit exactly to the armhole opening. These stitches will not be seen in the finished garment, as they are made slightly inside the seam. To sew a set-in sleeve, the sleeve seams are first sewn together, pressed, trimmed, and turned right-side out. Then two rows of gathering stitches are made at the top, curved edge of the sleeve, inside the seam line — two rows of stitches, rather than just one, allow more control when gathering the stitches. Next, these rows of stitches are pulled gently from one end to “gather” the fabric together slightly, easing the stitches so the resulting small puckers are evenly distributed across the top of the sleeve. Once the sleeve opening is the identical size of the armhole opening, the two are pinned together with the small puckers held tightly in place. The armhole seam is then stitched, with careful attention paid to ensure that the puckers remain identical in size, and that the fabric doesn’t fold over itself, which would make an unwanted, noticeable pucker or pleat on the outside of the armhole seam. When finished, the garment is turned right-side out and the set-in sleeve is pressed on the outside at the seam to create the finished look. A contrast to the set-in sleeve is the raglan sleeve, where the sleeve seam is below the natural shoulder line, giving a more relaxed, looser, less-tailored appearance. What Is a Side Seam? What is a Two-Piece Sleeve? What is a Wedge Sleeve? 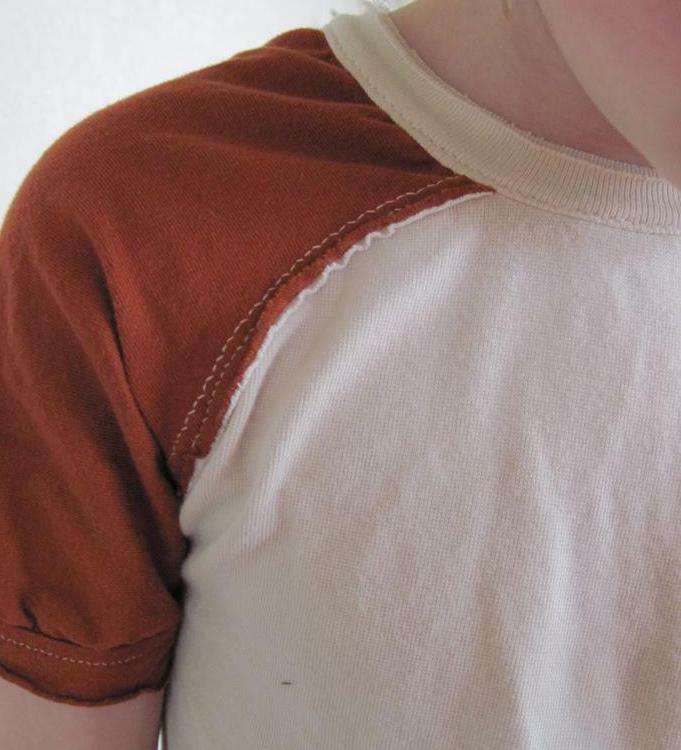 What is a Semi-Raglan Sleeve? What is a Batwing Dress? When I was little my mom used to sew matching dresses for my sister and I for holidays and special occasions. (Yes, the thought was nice but I hated wearing those matching dresses!) Anyway, my mom loved to make them with puffy sleeves. I remember seeing the dress parts once before she put it together. The sleeve caps for the set in sleeves were enormous! I'm not sure how she managed to sew enough gathers to make those sleeves fit into the armhole, but she did! @ceilingcat - I'm a knitter also, and usually I make sweaters with raglan sleeves. A raglan sweater is very easy to do when knit from the top. I had no idea there was a way to make a top down sweater with a set-in sleeve. I'm going to look into that further. Anyway, I'm fairly lucky, because I look all right in raglan sleeves. However, I have noticed that some people don't look all that great in raglan sleeves. I think it has something to do with shoulder shape. In my opinion, a set-in sleeve is the most universally flattering of all the sleeve shapes. And so versatile too! I've never sewn anything with a set in sleeve, but I have knit more than a few sweaters. I'm always amazed at how strange a set in sleeve for a sweater looks before you sew it in. It looks like it will be much too big too fit into the armhole, and yet miraculously it always fits! I've been exploring a technique for knitting a sweater with set in sleeves from the top down, so no seaming is required. I think I'm going to make my next sweater this way, because I had sewing all the pieces together at the end!